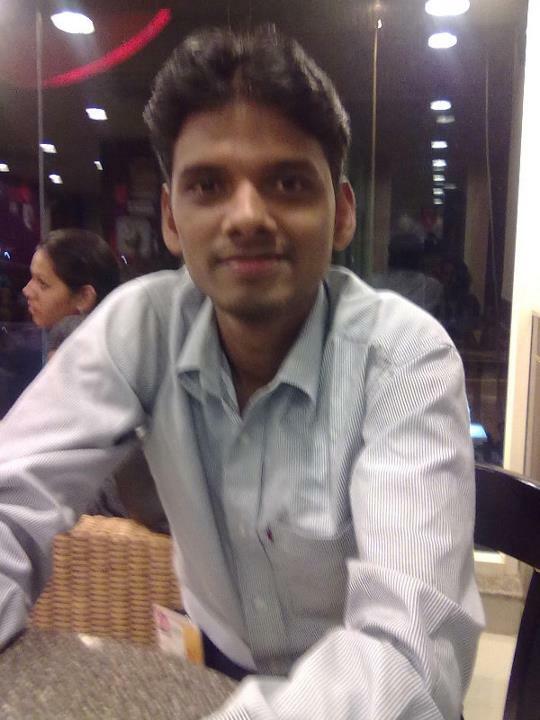 Deepak Roger, dotnet developer and tester is part of the Microsoft technology team InFI has developed for ZANEC in 2010. He joined a 15 member team, mentored by Microsoft dotnet experts for five months. His interests in Application development particularly on the Microsoft platform coupled with the mentors’ expertise resulted into making a great professional. Deepak worked on projects from day-one successfully completed and created many satisfied ZANEC’s customers for the last two years. InFI congratulates Deepak on his completion of two years’ service at ZANEC. He is a great team player and helps the team members to contribute to the project’s quality as well as making sure they stayed on the project’s deadlines. He currently holds the position of Software Engineer and is getting ready to play bigger role. Deepak’s expertise encompasses ASP.Net, WCF, Java Script apart from C# and dotnet. His goal is to be a Microsoft technology expert and an architect of highly complex software systems. Deepak can be reached at deepakroger.nm@zanec.com for guidance and help to be a successful developer in Microsoft Web technologies. 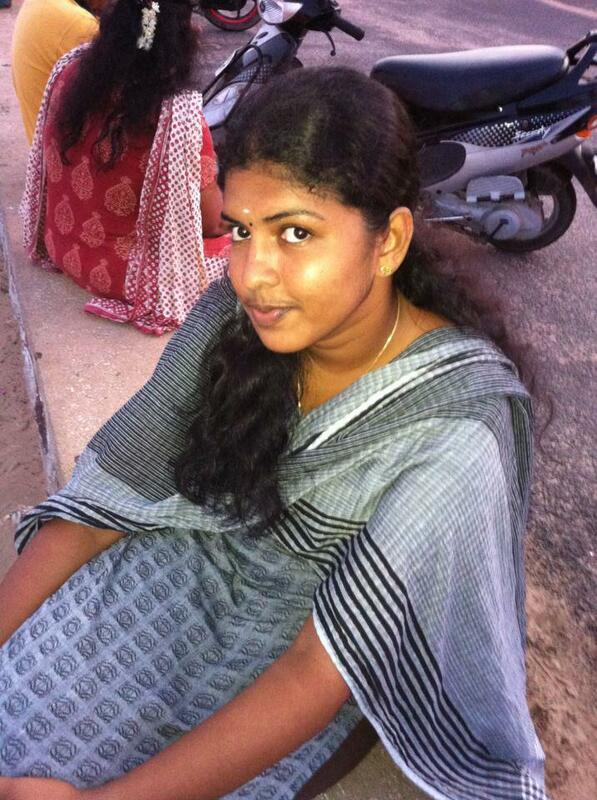 Preethi B, one of InFI’s best performers is a lead .net developer at ZANEC. InFI identified Preethi for the ZANEC .net team in 2010. She joined a 15 member team, mentored by Microsoft dotnet experts for five months. Preethi’s interests in Application development particularly on the Microsoft platform coupled with the mentors’ expertise resulted into making a great professional. She has worked on various projects and contributed immensely for a successful deliveries to ZANEC’s customers for the last two years. InFI congratulates Preethi on her completion of two years’ service at ZANEC. She is a great team player and helps the team members to contribute to the project’s quality as well as making sure they stayed on the project’s deadlines. She currently holds the position of Software Engineer and is getting ready to play bigger role. Preethi’s expertise encompasses ASP.Net, WCF, Java Script apart from C# and dotnet. Her goal is to be a Microsoft technology expert and an architect of highlycomplex software systems. Preethi can be reached at bspreethi@gmail.com for guidance and help to be a successful developer in Microsoft Web technologies. Jayakrishna B, hardworking and committed engineering fresher joined 10th batch of InFI’s IT-Infrastructure Support engineer program in August 2010. He has learnt, practiced and worked on Desktop H/W and Environment to build expert skills to troubleshoot and fix issues. InFI has deployed Jayakrishna to manage a network of 120 Systems at SRU for 6 months as part of InFI employment program. He had supported InFI learning environment consisting of Webservers, DB Servers and Network Management systems to mentor various other professionalization programs. Jayakrishna got opportunity to work at Pearson, the largest publishing company in the world to support their south India users as a contractor to start with. He performed so well, he is employed by Pearson as a permanent employee as IT Tech support engineer at Chennai. He is confident of reaching higher positions within the organization. InFI Wishes Jayakrishna great career and happy life. 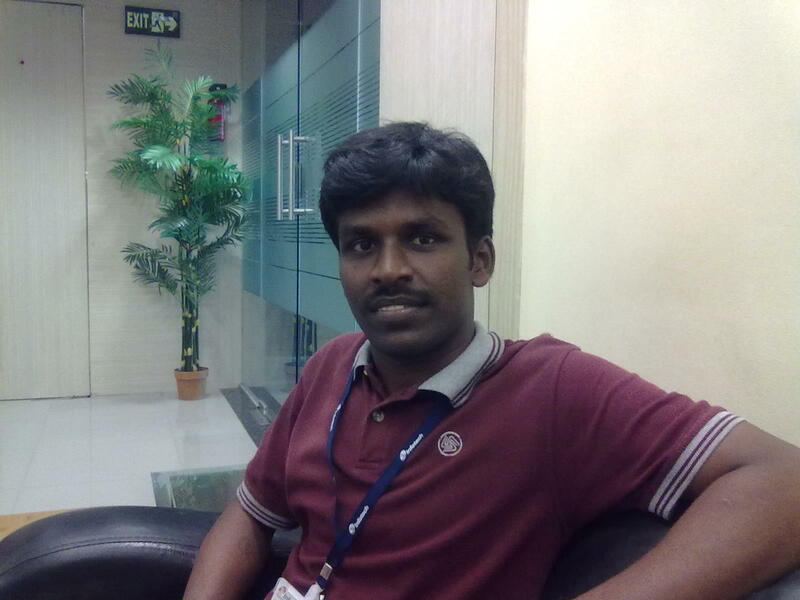 Velladurai Thangapandi joined InFI professionalization program Oracle Business Application Developer in June 2011. He worked extensively to gain expertise in Oracle programming and communication with the help of mentors from industry. Within three months he gained enough experience to be an application developer. He had joined Premia team and performed extremely well, which earned him permanent position in 3I-Infotech. 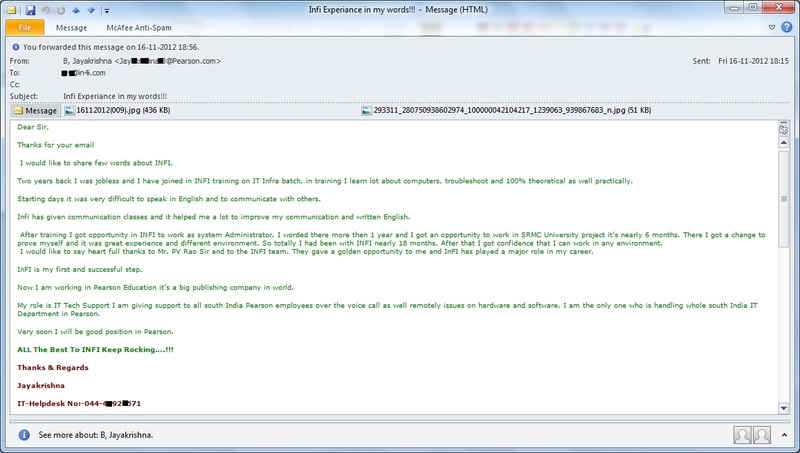 InFI congratulates him on his role change, we wish him great career in IT industry. 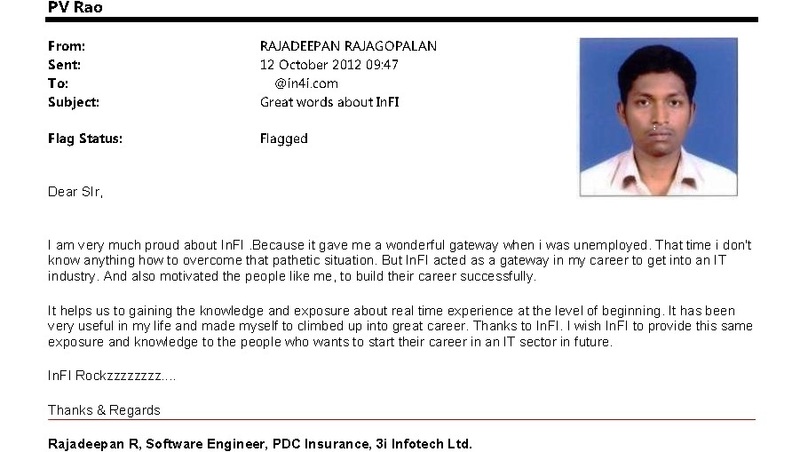 Rajadeepan Rajagopalan, is another professional who had successfully moved into IT career with InFI’s help through Business Application Developer program. He was mentored to be a productive and professional software project team member, who joined 3I-Infotech a year back as a contractor. Rajadeepan’s performance and commitment to the work got him permanent position with 3I-Infotech. 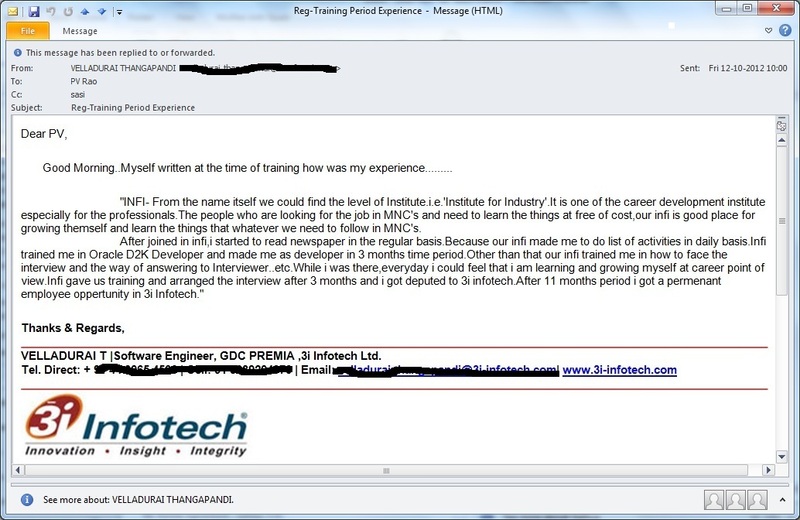 InFI wishes him a great career in IT industry.